When Julia Soldatova's mother used to skate, she often dreamed of having a daughter who would become a figure skater. When Julia Soldatova’s mother used to skate, she often dreamed of having a daughter who would become a figure skater. With Julia, her mother’s dreams became reality. Her mother started Julia in lessons when she was only four and drove her to the rink in Moscow every day, but didn’t pressure her to compete. “I was impressed with Katarina Witt as a child, but there wasn’t any special time that I decided to compete,” Soldatova stated. “I really just like to skate. Actually, I was also a swimmer when I was young and one coach suggested that I be a diver, but I was afraid because it was too high.” Diving’s loss was skating’s gain. To date, her results for Belarus have not matched her results for Russia. 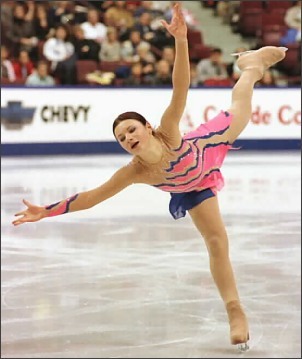 Soldatova won the Karl Schafer Memorial and the Vienna Cup in 2000, but had to withdraw from the European Championships in both 2001 and 2002 due to injury, but finished 20th at the 2001 World Championships. She placed 18th at the 2002 Olympics as well as this year’s worlds. She previously had won the 1998 Junior Grand Prix Final, the 1998 Golden Spin of Zagreb, and the 1997 Hungarian Trophy. Julia enjoys training with other top skaters in the group with Elena Tchaikovskaia and Vladimir Kotin. “When one is skating better, it pushes the rest to get better,” she said. Every day, Julia trains for 2-3 hours on ice and an hour off ice doing choreography, balletics, and conditioning. “I used to just jump, but now I’m focusing more on choreography and skating to my music. I like to skate to slow and soft music. Usually, my coach finds music and suggests it to me and I choose. Then I work first with my coach on the moves, then with my choreographer for polishing.” Her music for this season is “La Ballade de Carmandiana” by Richard Clayderman for the short and “Luna de Paris”, “Une Folle Envie d’Aimer”, and “Lupita” by Raul di Blasio for the free skate. Kotin is her choreographer. Julia likes to “do other things to get my mind off of skating. I like reading mysteries, especially Sidney Sheldon. Watching television and listening to music. I also read historical books. I don’t play other sports, but I like tennis a lot and I’d like to learn how to play.” She enjoys holidays everywhere. “I went with my family one summer to Disney World, Universal Studios, and other tourist highlights. I don’t like to go into the sea, but I like to lie in the sun.” Julia collects stuffed animals, especially teddy bears, and has a Siberian longhaired cat named Misha.